La Befana arrives in Ischia! Welcome to our Ischia blog, Good Morning Ischia! Here you can see the entry for Monday 6th January 2014. Well in all truth it's a case of "Good Evening Ischia" today as the holiday season continues for one final day in Italy. 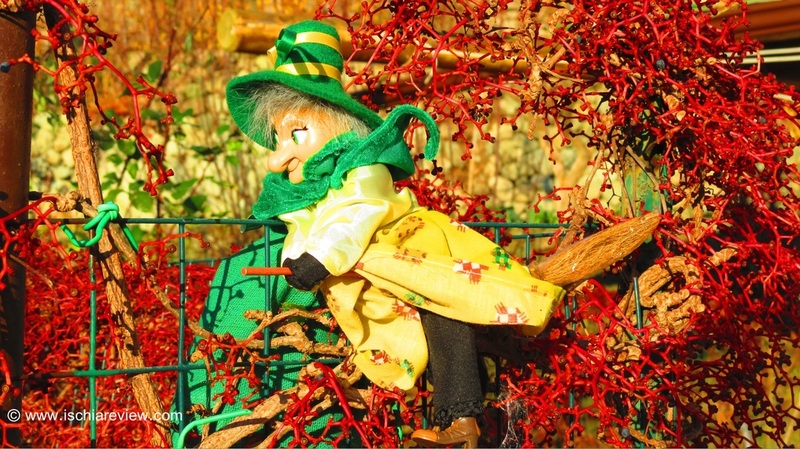 However, by leaving the blog until a little later in the day it does give me the chance to reflect on what was a fabulous Epiphany, known locally as La Befana. Weather-wise it's been beautiful here with warm temperatures and sunshine throughout the day, at one point we were up to 16° Celcius (62° fahrenheit) which is quite incredible for mid-winter, even in Southern Italy. The evening isn't too chilly either and right now with the sun down it's around 12°C (54°F). If you look slightly further down the page you'll see the weather forecast for the next three days is for pure unadulterated sunshine so let's hope the weathermen have got it right and we can enjoy a week of sun-kissed pleasure. With that wonderful start to the day and with the gorgeous weather outside I decided to take the recently acquired scooter for a spin around the island. It's amazing how much more you can see and feel on two wheels rather than in a car, the warmth of the air changing regularly as you turn a corner and head in a new direction or the ability to stop pretty much wherever you want to admire the views or to take a photo. Riding around the hilly region of Serrara Fontana was a particular treat with the neighbouring island of Capri seemingly within touching distance and the Italian mainland with Sorrento also clearly visible. As today is the last official day of the festive period it'll be slightly sad to see the decorations that have become part and parcel of the island's landscape over the last month taken down tomorrow but the glorious weather should be enough to banish any slight post-Christmas blues. Anyway that's all from me today, I'll be back with more tomorrow and hopefully restored to the morning slot, the blog is after called "Good Morning Ischia!"